Herefordshire & Worcestershire Chamber of Commerce was delighted to launch its third annual Business Manifesto for 2019 at an exclusive event at Worcestershire County Cricket Club on Friday 25 January. The launch event welcomed over 100 business people to hear the key policy wins in 2018 and discuss the main policy objectives and campaigns for the next twelve months. The manifesto is a collection of Herefordshire and Worcestershire’s key business priorities for local and national government, which have been produced based on the Chamber’s interactions with over 600 local companies in the Quarterly Economic Surveys (QES), Area Council meetings and daily talks with Members. Nationally businesses have experienced delays in parliament, with the Prime Minster’s Withdrawal Agreement and Political Declaration being rejected earlier this month and facing a vote of no confidence in her own party. Locally, low unemployment and the national skills shortage continue to challenge businesses alongside concerns regarding Brexit and unreliable connectivity. The manifesto highlights these issues to raise awareness at Westminster to work towards solutions, to ensure that Herefordshire and Worcestershire remain a great place to do business. Guests heard from Sharon Smith, CEO at H&W Chamber, Cassie Bray, Director of Business Engagement at the Chamber, Hannah Essex, Co-Executive Director of Policy and Campaigns at the British Chambers of Commerce (BCC), Neil Schofield, Head of External & Governmental Affairs at Worcester Bosch and Robin Walker MP, Parliamentary Under Secretary of State at the Department for Exiting the European Union. The event culminated with a Q&A session with the panel of speakers, where delegates were able to have their say on the concerns that are currently affecting their businesses and/or sectors. Commenting on the launch, Sharon Smith, CEO at the Chamber, said: “It was fantastic to see so many business leaders come out to support our priorities for 2019. 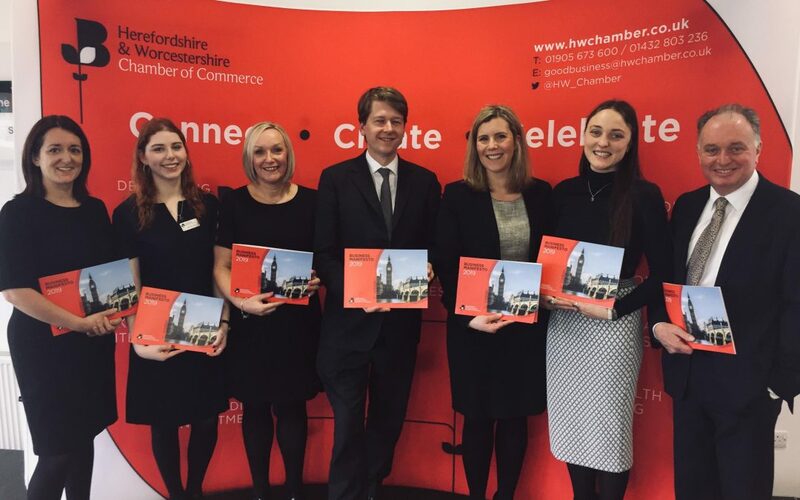 To find out more about the Chamber’s Business Manifesto 2019, please contact the Policy department on policy@hwchamber.co.uk or call 01905 673 600.